Much like my skin, my hair tends to be on the drier side. It's not the most terrible of hair conditions to have, but finding a shampoo that cleans well- I have no tolerance for dirty hair- but doesn't strip it AND a conditioner that gives my hair all the hydration it craves without weighing it down can be a bit of a challenge. I'm sure plenty of you know exactly what I'm talking about. 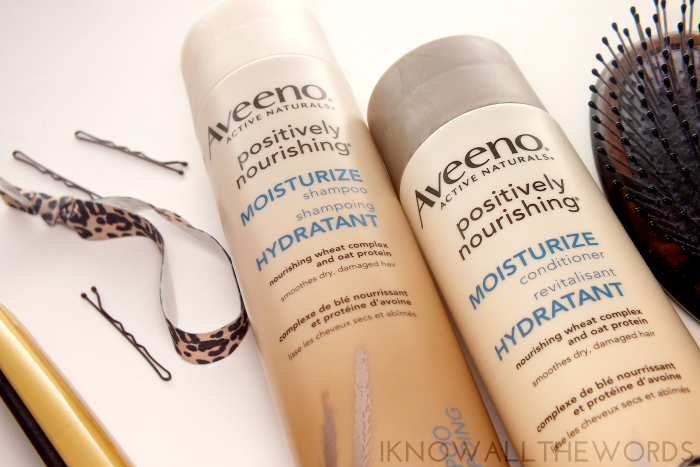 That said, when the opportunity to test Aveeno Positively Nourishing Moisturize Shampoo & Conditioner came about I just couldn't pass it up. Read on! 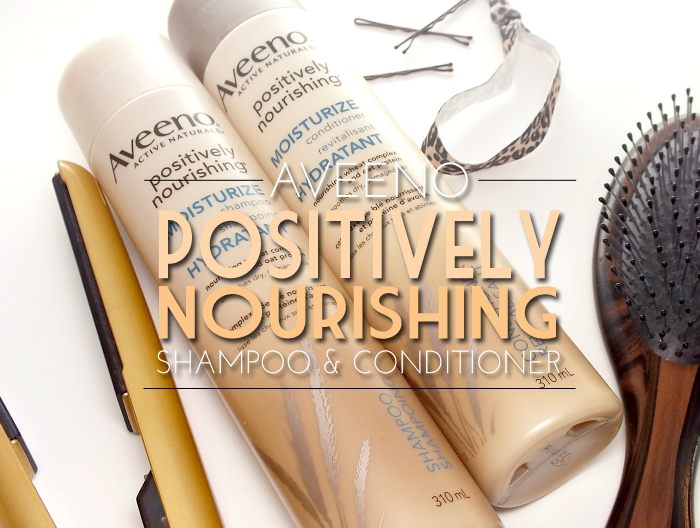 Aveeno Positively Nourishing Moisturize Shampoo & Conditioner is made up of a formula that includes three elements- the Aveeno exclusive Active Naturals technology, nourishing wheat complex, and hydrating oat protein- to quickly provide hair with moisture and target areas that need repairing all while being safe on colour treated hair. I never used to pay a lot of attention to whether shampoo was colour safe (even though my hair is always a colour other than my own) but since I've been using brighter, more unnatural shades (many of which are semi-permanent) has made me very careful with what I use. I was very pleased that the shampoo didn't strip colour. On top of smelling amazing- both the shampoo and conditioner smell so good!- they both give hair the perfect dose of hydration. I wasn't sure about a hydrating shampoo, as I wondered if it would leave my hair heavy, or greasy faster than a typical shampoo, but as it's formulated with a specific blend of surfactants and conditioning agents that sweep away dirt and oil while preparing hair for the absorption of additional conditioning agents found in the conditioner. A little bit of shampoo science for you. I don't always use typical conditioner, as I've been trying to process my hair with less water to keep the colour and as such have been opting for leave in conditioner more, so I really noticed the difference that this shampoo has on my hair. Even without using conditioner the shampoo alone leaves my hair softer, more hydrated, and smoother. Of course, for every great shampoo, there is usually a conditioner, and this one doesn't disappoint. Using the same three elements of the shampoo, the conditioner hydrates and targets damage by strengthening and leaving it less prone to breakage and future damage. The conditioner has a rather light feel. creamy but not super thick, but it applies and rinses easily. I love that it doesn't weigh hair down and leaves it soft, smooth and in visibly better condition than before washing and conditioning. Overall, these are definitely products worthy of precious shower space. While I do indulge in pricier hair care from time to time, I love knowing that I can find products that perform just as well at the drugstore- and for a fraction of the price. Tried these? What are your favourite shampoo/conditioner?